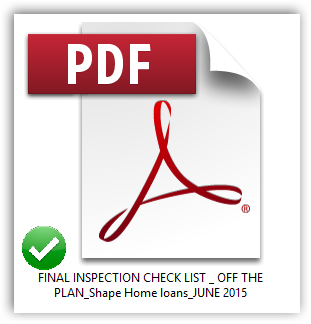 Download our free off the plan checklist ( PDF) when you go for your final inspection. No login or sign up required. Click and go. While all care has been taken in the content of this documentation, Shape Home Loans accept no liability for any loss suffered as a result of clients using this documentation. Tip: Inspect the property during a bright sunny day, preferably during daytime/lunch time; this will enable you to view the paint job and any default in a better light. Paint is not bleeding through. If done properly ( ie min 2 coat of paint) you should not see the color of the base material, this can only be check during the daytime, under good light. Ensure that the hot water system is functioning - is the water from the hot tap, hot? Tip: When testing the water for the laundry tap there is normally no bucket or sink to catch the water, use the cup you bought or coffee cup as a mini bucket to catch the water. Check the shower screen seal ( on the bottom- plastic) is correctly fitted and there's no gap. Check for any major scratch on appliance or glass. Tip: You may want to measure out the spaces so that you can go furniture shopping - Ie fridge space/ Laundry/ bed/ sofa/ TV. Lastly if you buy a fridge with a auto icemaker or Water cooler; you have to make sure that space is fitted with a plumbing tap for the water.